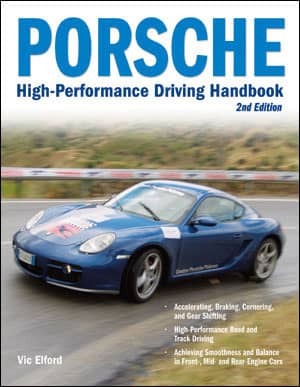 It’s been more than a decade since the first Porsche High Performance Driving Handbook set the standard for getting the most out of a Porsche. If driving techniques haven’t changed since then, technology definitely has. This book, by the world’s foremost expert, takes that new technology into account as it gives readers the latest information on how to drive a Porsche to its limit. Once upon a time, the Can Am and Trans Am race series changed their rules because Vic Elford and his Porsches were winning too often. Here Quick Vic shares his insights into ride control systems, new tire compounds, and Tiptronic and Direct-Shift Gearbox transmissions, all of which have transformed the experience–and the challenge–of driving a Porsche. As he discusses recent models, ranging from new generations of the 911 to the whole-cloth inventions of the Boxster, Cayenne, Cayman S and Carrera GT, modern images and historical photos immerse the reader in both the history and the evolving technology that Vic Elford knows like no one else.